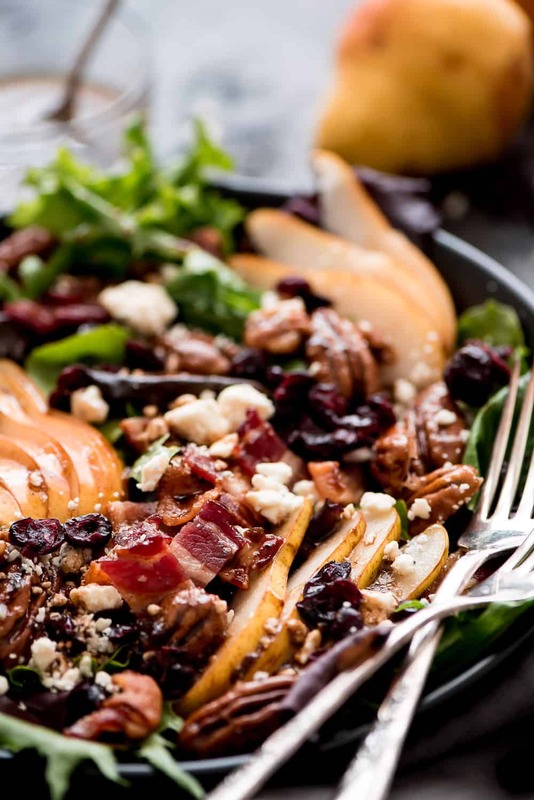 Fit more greens into your diet with this Bacon Pear Gorgonzola Salad. This sweet and savory salad is loaded with all the best toppings and tossed in a balsamic vinaigrette. Hello! 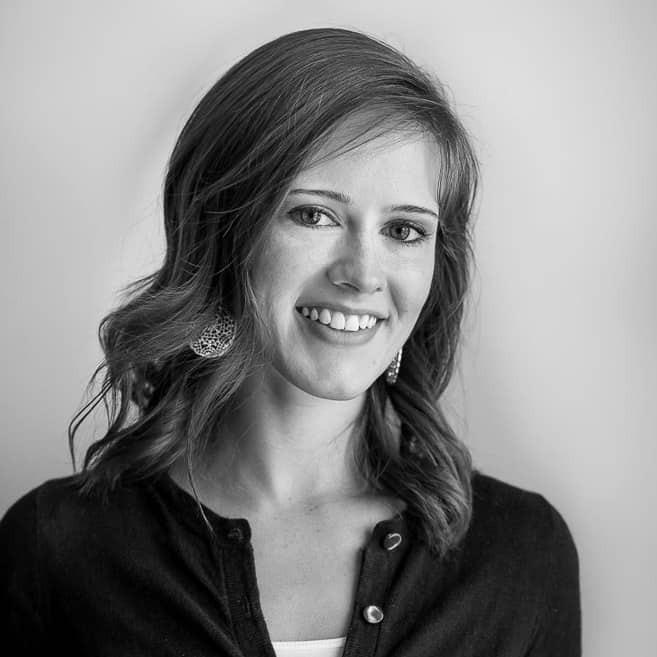 It’s Melanie here again from Garnish & Glaze. It’s the beginning of the year so I’m guessing many of you are still going strong with your New Year’s resolutions. This year my resolution is to eat more veggies and since snacking on raw veggies isn’t my favorite, I try to eat a salad everyday. 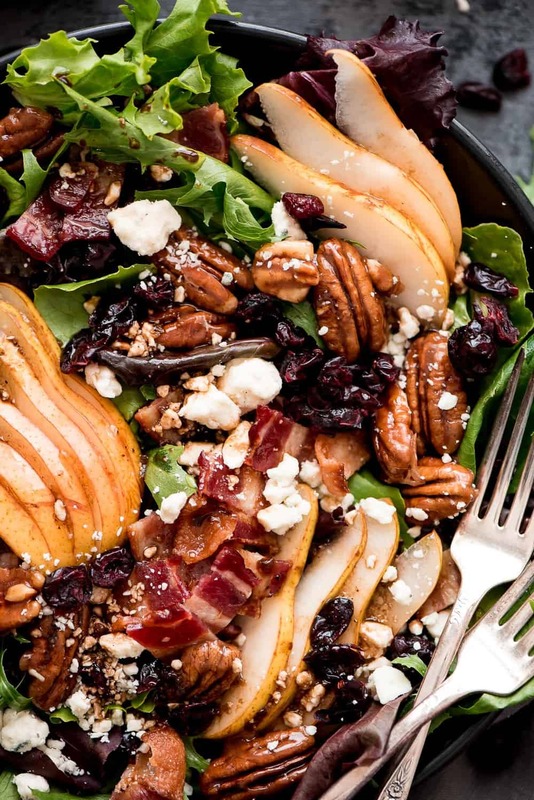 This Bacon Pear Gorgonzola Salad is my current fav! Bacon on anything makes it 852x better, especially salad. Every bite you take with a salty, crispy piece of bacon will be a party in your mouth. I’m big on texture so the more crunch in a salad, the better. 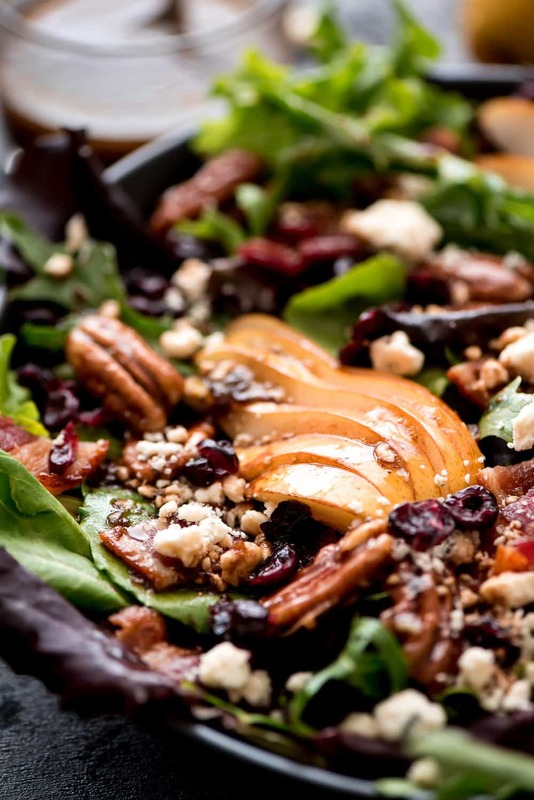 In addition to the crispy bacon, this salad is topped with roasted pecans. You can put them in raw but roasted gives them a crunchier texture and brings out the nutty flavor. All you have to do it toss them on a baking sheet and bake for 5-6 minutes. Since I have a major sweet tooth, I love putting fruit in my salad (Poppy Spinach Seed Salad is my favorite!). Since fresh berries are in season right now I use apples or pears and a handful of dried cranberries. They add the perfect amount of sweetness. The toppings to this salad are so good I almost forgot about the whole reason I was eating it- the greens! I like to buy the one pound container of spring mix or baby spinach from Costco. I use it all week long making salads for lunch and a green smoothies for a snacks. 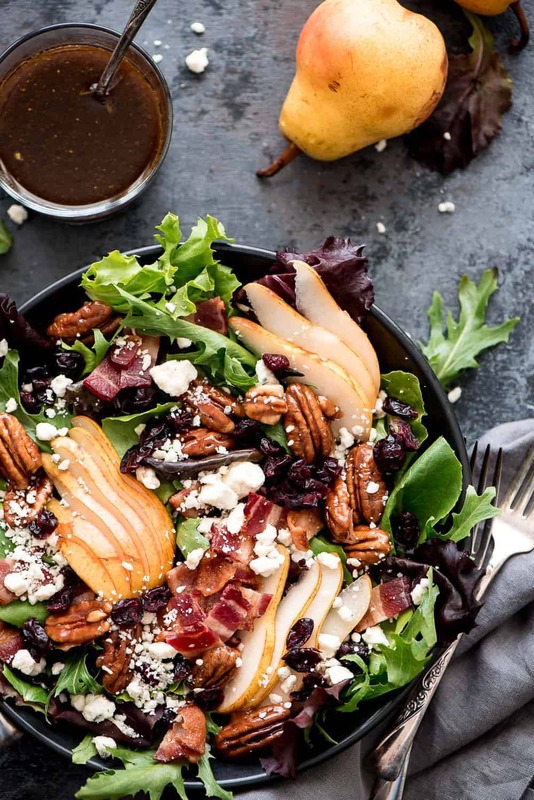 Join with me in a year of eating healthier starting with this awesome Bacon Pear Gorgonzola Salad. Enjoy! Toast pecans on a baking sheet for 5 minutes at 350 degrees F.
Cook the bacon in a fry pan or bake on a rimmed baking sheet lined with parchment paper at 400 degrees for 20 minutes or until done. Drain on a paper towel lined plate, let cool completely, and dice. Combine all the dressing ingredients in a jar with a lid and shake well. In a bowl, place the lettuce, pecans, cranberries, cheese, and bacon. When ready to serve, add the pears and dressing and toss. Serve immediately.